We tried all of the brands throughout the years. Our progression through the brands went from the inexpensive to the expensive. 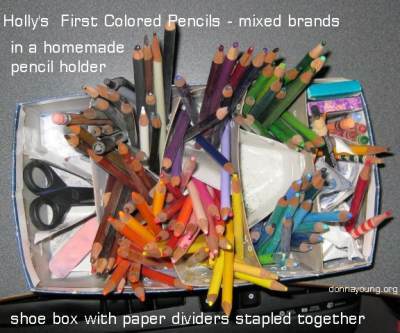 Holly's first colored pencils were inexpensive and picture below in the homemade pencil holder. In the holder, I grouped the pencils by color and as you can see, they are still grouped by color. Holly continued the sorting method. The mix of brands pictured above consists of Prang , Kodak, Crayola, and RoseArt . The pencils were purchased during the 1990's. 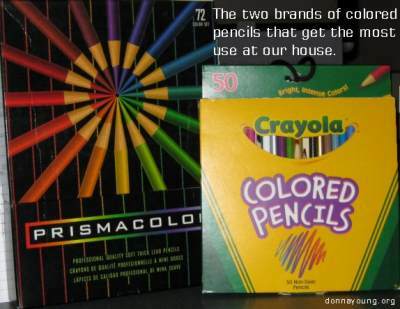 Prismacolor Pencils and Crayola Colored Pencils were the most favored color pencils at our house. 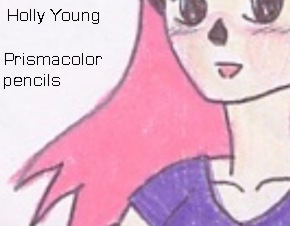 I purchased for my daughter Holly a 72-pencil boxed set of Prismacolor Pencils as a gift years ago, late 90's more or less. She liked the pencils and used some of the colors up and we purchased replacements. The coverage that one can get from Prismacolor® pencils is excellent. To illustrate the coverage, Holly has allowed me to show a couple of her old drawings. The drawings shown below are some of her first efforts at using Prismacolor® pencils. The examples below show how densely the colors can be applied as shown in the thick pink and red (in places) of the subjects' hair. The colors can blend. 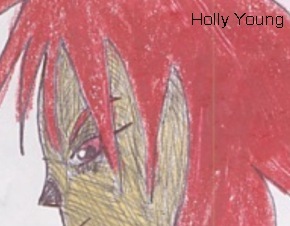 Even in Holly's inexperience, she was able to make delicate skin tones in the first drawing. Sample drawings with prismacolor pencils by a 10 year old. Crayola Colored Pencils fall into the inexpensive category. My daughter has been using them a lot lately. The coverage is not as dense or creamy as Prismacolor®, but apparently they are good enough for what she is currently working on. You may see examples at Crayola® Samples.